Inequality is one of the few things in which Britain remains a world beater – of the world’s ’developed’ economies it is second only to the US. But the seemingly relentless growth of inequality is a worldwide phenomenon. According to Oxfam the richest 85 people in the world have the same amount of wealth – $1.7 trillion – as the bottom half of the Earth’s population: 3.5 billion people. The serious strategists of capitalism vaguely recognise that the future of capitalism is threatened by growing inequality. When the head of the IMF and the governor of the Bank of England join in the chorus demanding ’something should be done’ or ’stability’ will be threatened, it is clear that fear of strikes, revolt and revolution is growing among society’s elite. 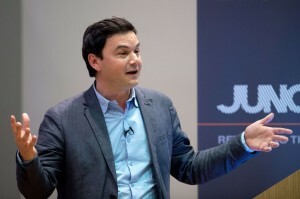 It is against this background that the French economist Thomas Piketty has published Capital in the Twenty-First Century. 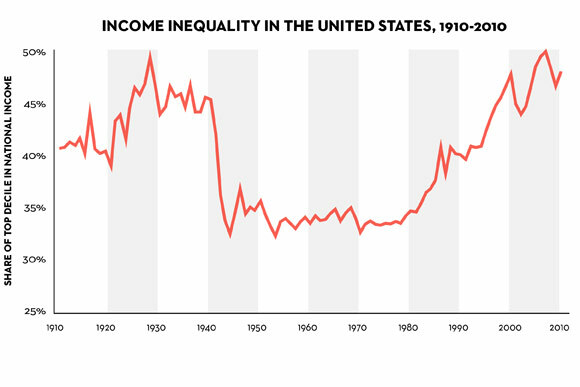 Piketty has worked with other economists over the last fifteen years to give empirical evidence of a long term trend for capitalism to increase inequality. Piketty correctly argues that the economic upswing which followed the second world war was exceptional, capitalism has now returned to ’normal’ with a clear tendency for inequality to grow. He explains, for example, that “the richest 1% appropriated 60% of the increase in US national income between 1977 and 2007”. Nonetheless, the statistical information drawn up by Piketty and his associates is very useful, and is also clearly seen as a threat by some who defend capitalism. The Financial Times has leaped to attack his data on inequality, picking out what seem to be relatively minor statistical errors to try and discredit Piketty’s general conclusions. The problem with this, though, is that far from being ’revolutionary’ or ’new’ Piketty’s statistics confirm a trend that has been clear for decades. 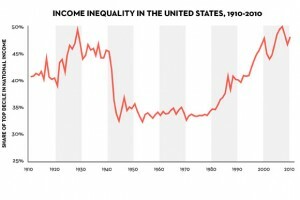 Piketty himself has responded by saying that, far from his book exaggerating inequality, on the contrary research since it was published shows that: “the rise in top wealth shares in the US in recent decades has been even larger than what I show in my book”. 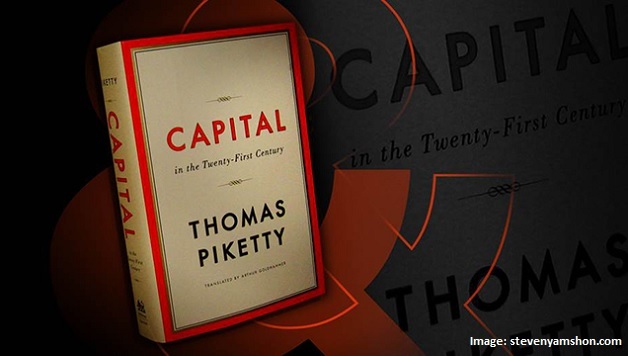 While some on the right have tried to discredit Piketty, his book has been a hit with the public, topping best sellers lists in many countries. Many on the left have praised it, including in Britain Unite general secretary Len McCluskey, who has said he is ’excited by where Piketty might take us.’ However, those who hope the book will provide a convincing analysis of why capitalism creates growing inequality will be disappointed, even more so those that are looking for a solution. The title of the book, echoing Marx’s central work Capital, has led many commentators to claim that Piketty is the modern successor to Marx. Piketty has said that is not how he sees himself and that, in fact, he has never read Capital. This isn’t surprising given that where Marx is mentioned it is usually to criticize him, often inaccurately. He claims, for example, that “like his predecessors Marx totally neglected the possibility of durable technological progress and steadily increasing productivity” and that “Marx’s theory implicitly relies on a strict assumption of zero productivity growth over the long run”. These statements are the polar opposite of Marx’s real position. Marx explained that a fundamental feature of capitalism is the way that the drive for profits forces the capitalists to compete against their rivals by investing in science and technique – ’technological progress’ – in order to increase productivity. The blind drive for profit leads to crisis – to slumps and recessions – but has also created the material foundations for a democratic socialist society. Marxist or even socialist ideas are, however, a closed book to Piketty. He does not attempt to explain the reasons for capitalist crisis. Nor does he deal with the production of goods or their sale at all, instead concentrating exclusively on the division of wealth. His ’new theory’ to explain growing inequality is that the rate of return on ’capital’ always exceeds the rate of return on ’income’. Piketty says that this is the central contradiction of capitalism. However, he does not explain why this should be the case. In addition, what he calls ’capital’ is a misnomer. For Marxists not all wealth is capital, but only that wealth that is put to work by the capitalists in order to try and make a profit; the root source of that profit is the exploitation of the working class. But when Piketty talks of capital he means all wealth, regardless of whether it has been invested by a capitalist, is a diamond necklace, or a worker’s home. Nor is the strength or otherwise of the workers’ movement, and its ability to fight to defend workers’ pay and conditions, considered by Piketty as a factor in what share of wealth goes to the capitalist class, and what goes to the workers. Piketty is interested not in ending capitalism, but in rescuing it. Asked on Newsnight whether he wanted to get rid of inequality he made his position very clear. In Britain at the moment, he pointed out, the bottom 50% own 3% of the wealth. This is too little – but five or maybe 8% would be okay! This gets to the nub of the issue. Piketty hopes to appeal to the ’good sense’ of the capitalists, pleading with them to recognize that if they want to preserve their system it would be better to give a bit more to the ’99%’. This is not dissimilar to Labour leader Ed Miliband’s calls for a ’fairer capitalism’, although Miliband has made no proposals to dramatically increase taxes on the rich or big corporations. Piketty partially recognizes that the capitalists will always try to escape paying taxes by moving money abroad and so on. This is the reason that he adds a worldwide progressive wealth tax to his proposals. Again, socialists would support this demand but it is not possible to separate the introduction of such a measure in a world of capital flows – which national governments are unable to control – from the need for wider, socialist measures. Who would implement such a tax? Without a state monopoly of foreign trade and the nationalization of the banks, first of all on a national and then on an international scale, a worldwide millionaires tax could never be implemented. It would be similar to trying to pull out the claws of a wild tiger ’peacefully’. Despite its limitations, the popularity of Piketty’s book is nonetheless an important indication of the growing search for an alternative to twenty first century capitalism, which offers a dismal future of low paid jobs, zero hour contracts and unaffordable housing. Many who plough through Piketty will then go on to find the original Capital along with the other works of Marx, which give a far more ’modern’ and ’relevant’ analysis of capitalism than Piketty is able to do.